Left speechless by half an episode with no words. Perhaps the best way to talk about this episode is to barely do so. Not because it isn’t worthy of discussion, of course. 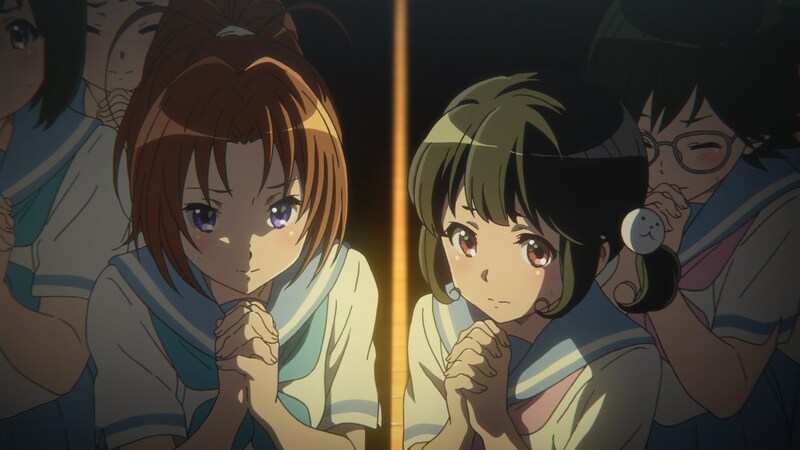 And not because I can’t say anything about it either – from the early scene where a distressed Kumiko cowers and finds refuge when talking about her upcoming trial, to the backstage scene that nails the mix of upcoming dread and anticipation while guiding your sight from group to group, there’s so much I would normally highlight. But the truth is that the episode is dominated by a seemingly endless performance, exuding the confidence required to pull off a sequence like that with no dialogue whatsoever for half its runtime; something ridiculous from a pure production angle but also from a TV anime structure standpoint, yet executed as if it were a natural thing to do. The masterful smash cut that leads into it, which is only properly conveyed with audio. 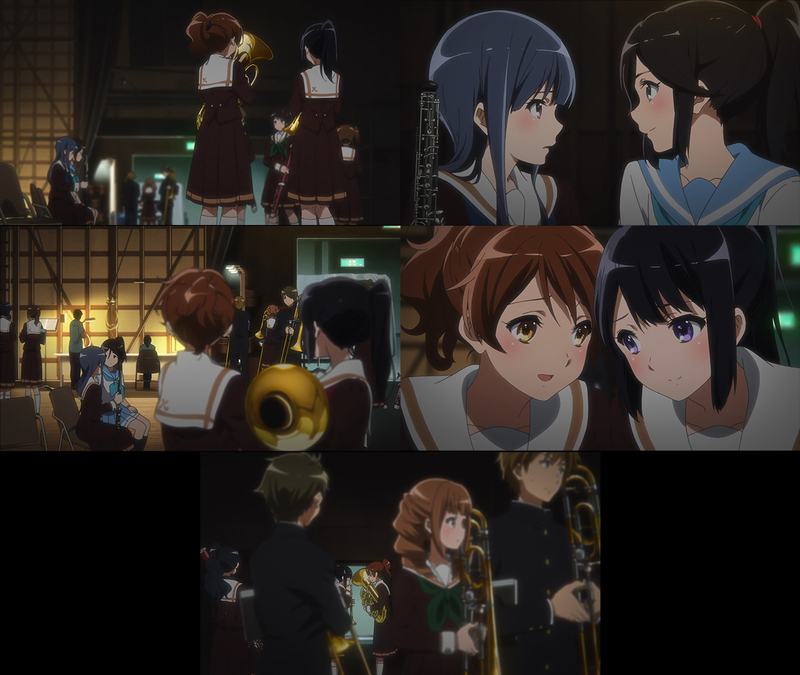 Their companions peeking into the performance while displaying different attitudes that spell out their personalities and standings in the band. The memories pushing the club forwards, and the eyes set on a goal. And of course, the mind-boggling animation endeavor that a fully animated performance like this represents; the obscenely detailed mechanical drawings, the animated character acting, even the environment reflections that the photography team has become very fond of since the recap film. All of this comes together to create a musical performance with terrifying accuracy – I’m far from the right person to judge this, but based on the comments by people who do know the field, the franchise has an incredible track record when it comes to this. 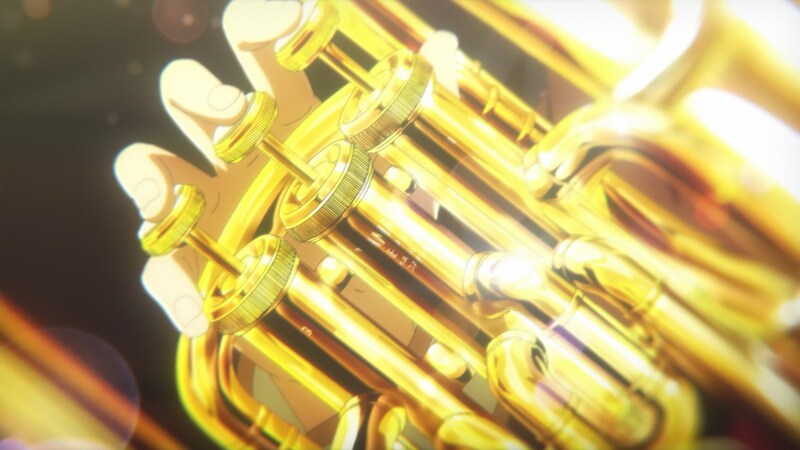 Animation isn’t constricted by realism however, which is why this episode also gets to embrace the dream-like moments as the musicians get into a trance. I can point out all these things, but these are words, and my words to boot. This time I’m going to be rather useless and say just watch the episode. Let me make up for that by explaining how it came to be, at least. 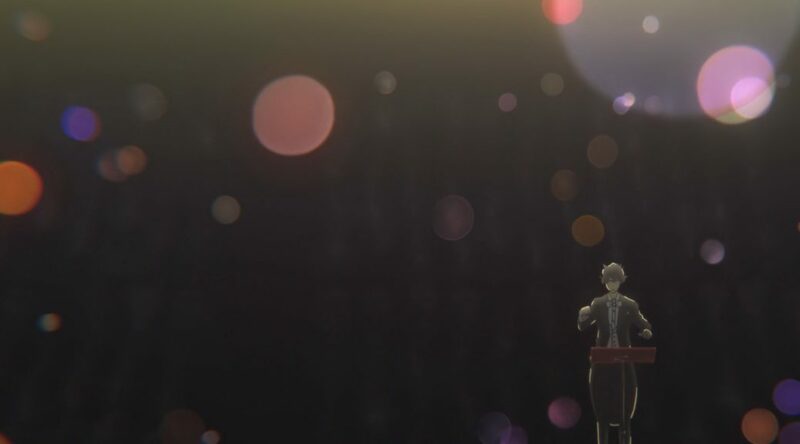 The performance was presumably drafted by Tatsuya Ishihara – a task that was always in Naoko Yamada’s and his hands – but otherwise the episode was directed and boarded by the one and only Yoshiji Kigami. The eccentric man who chooses to be credited as Ichirou Miyoshi when storyboarding, as Fumio Tada when doing key animation, but who then goes and draws many scenes uncredited in his episodes anyway. And also the man who shaped the current Kyoto Animation – a fascinating story I’m going to try and keep short, since its actual scope is as big as the entire Japanese animation industry. It’s not a pure dichotomy, but anime’s current state can be described as the outcome from an ideological battle: Toei Douga’s Disney-influenced exhaustive character acting versus Tezuka’s economic approach that rather embraces animation as expressionistic illustration with limited movement. As you’re likely aware, the latter won this war, but it’s not as if the former entirely disappeared; it partly embraced limitations and lived through studios like Shin-Ei Douga, a company Kigami happened to frequent and that definitely shaped his style – rich animation leaning towards realism, yet willing to embrace exaggeration as conveying emotion is more important than authenticity. 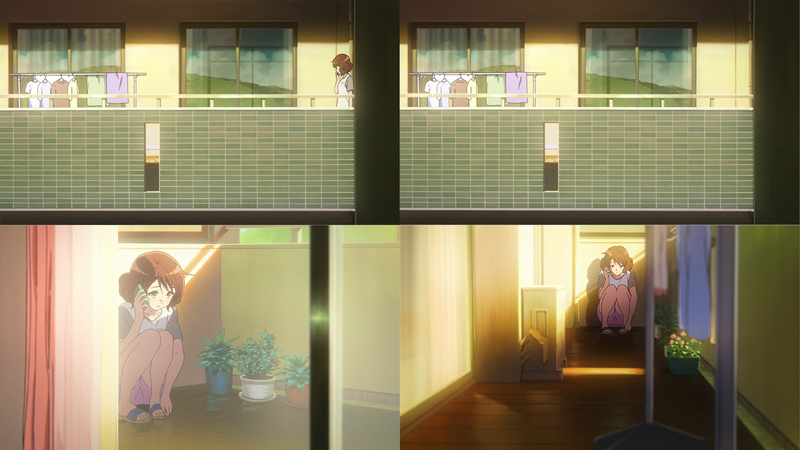 It was during the early 90s that a relationship was truly born; both between a still unknown Kyoto Animation and Kigami, and between Shin-Ei and KyoAni – one of the rare connections the studio still keeps with the industry as a whole. After a series of impressive collaborative work that turned heads around even back then, Kigami ended up joining KyoAni and pretty much making it his own. The animation philosophy I mentioned earlier is what truly defines the studio’s culture at this point. Actual character acting. We aren’t used to extensive character movement in TV anime, unless it happens to be a climactic scene with notable draftsmanship. Even modern Japanese animation appreciation was born from the passion lit by those isolated moments – that’s how sakuga culture got started. The studio’s lowkey character animation is a complete anomaly in this environment. Even when the drawing count is low, they’ll go to great extents to depict every small gesture, making a character’s demeanor an actual element in their production. Conquering that approach is something Kigami played a massive role in. As a member of the company’s board of directors, instructor in the KyoAni School and revered animator within the group, it’s no wonder he’s had such a huge influence on every level. To understand his figure it’s also important to keep in mind that the anime industry is built on a foundation of personal relationships, a net of acquaintances that keeps on growing due to all the freelance talent collaborating. 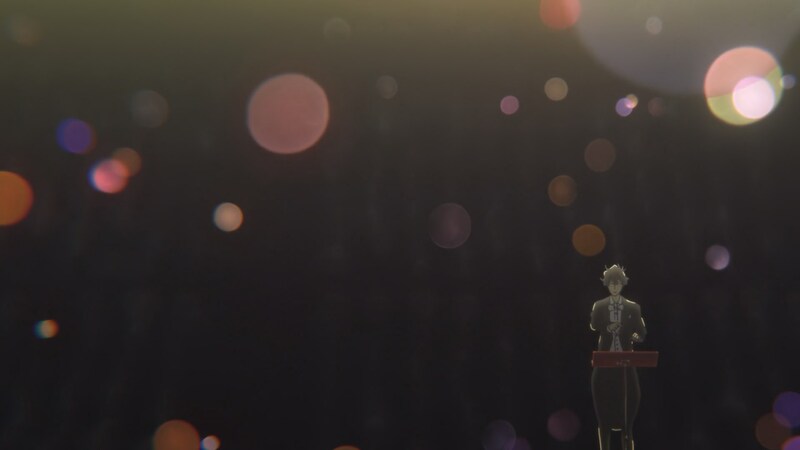 This puts KyoAni in a rather peculiar spot – they are widely revered, moreso than part of the western fandom would be comfortable with knowing, and yet their ostracism means that there are no such bridges when it comes to them. Kigami acts as pretty much the sole link here, since he worked on many outstanding animation feats before joining the studio; his portfolio includes works like Akira and Sasuga no Sarutobi, and in his youth he earned both the admiration and rivalry of the likes of Toshiyuki Inoue and Hiroyuki Kitakubo. He’s considered KyoAni’s star animator by the creators outside the studio as well, and for a good reason. Contrasting with Kigami’s experience, the lineup of animation directors couldn’t be any younger this time around. 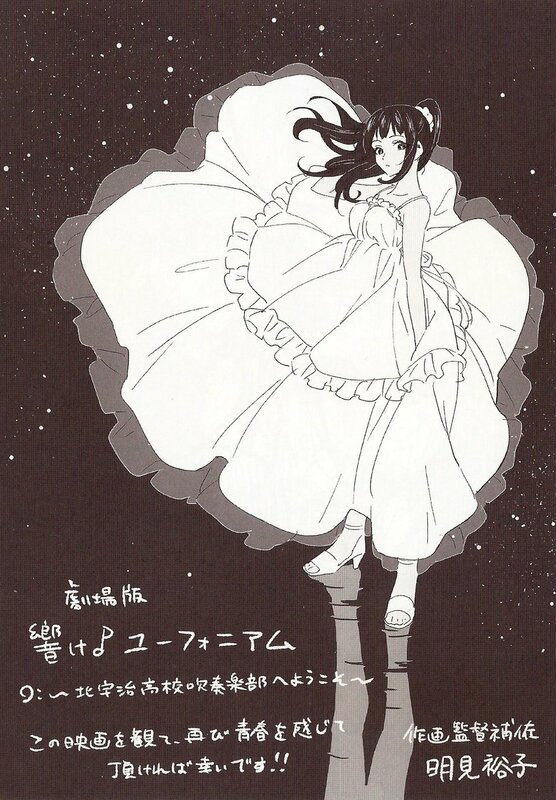 When Yuuko Myouken was in high school she already had her eyes set on Kyoto Animation, a goal she achieved in 2012 when she joined the studio. Her supervision debut in TV anime was just this year, after having done so for the first time in High Speed!. Her art is very attractive, and she seems to have an eye for scene composition as well since she was already appointed as one of the layout supervisors on Koe no Katachi. Yuuki Tsunoda only precedes her slightly, having joined in 2011 and then become an animation director at exactly the same time as Myouken. 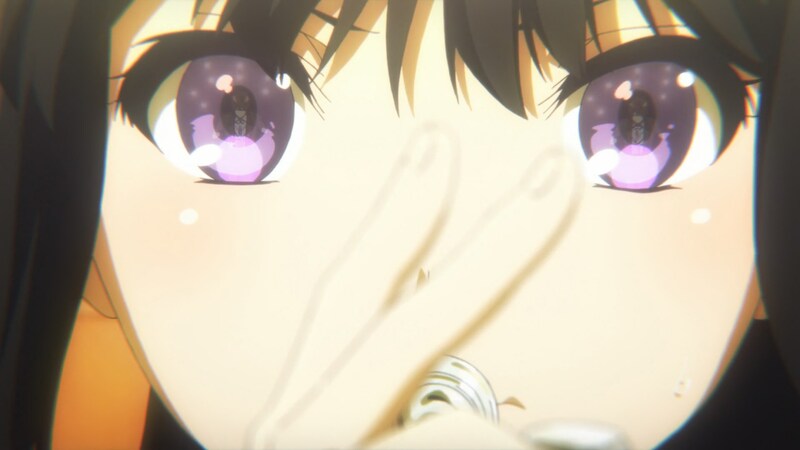 His most notable personal achievement might be having become the illustrator of a KA Esuma novel, which was understandably overshadowed by Akiko Takase’s outstanding work with Violet Evergarden. If we’re talking about youngsters and newbies though, it’s clearly Tatsunari Maruko who we should be highlighting since this was his debut. As I mentioned with the episode 2 post, it’s a studio tradition to give rookies an assistant role before they fully move up to their new position, hence why he showed up today. Maruko graduated in 2010 from the Sapporo Manga&Anime Academy – you can even watch his graduation project, where he was in charge of the character designs and animation direction, as well as some key animation, in-betweens and even background art. He eventually made it to the industry by applying to the studio in 2011 and joining in 2012, where he was quickly promoted to key animator. And now once again he’s moved up to supervision. Unlike cases like the aforementioned Myouken and Takase, Maruko’s art seems to be defined by the clean and steady lines rather than having striking presence. And to be fair, that’s a quality valued in animation directors! 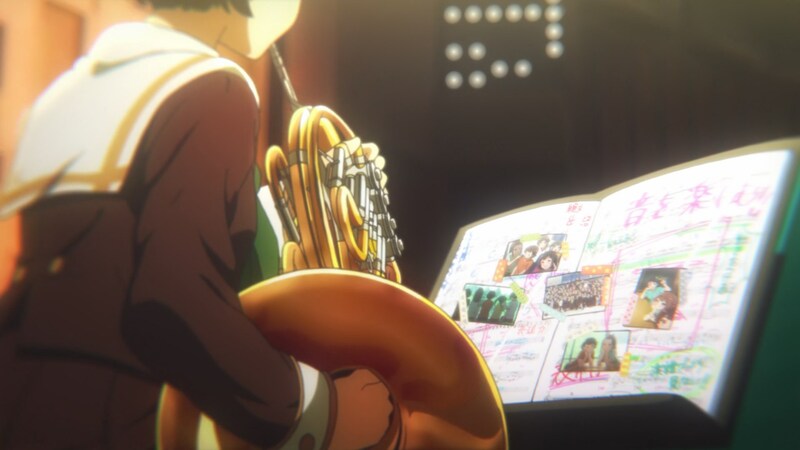 Their job is to ensure drawings are all high quality, which is why many adventurous artists at KyoAni – and arguably their best animators – go on to become episode directors instead. It’s not as if strong visual personalities aren’t welcome in the field, but the ability to polish the art while in motion reigns supreme. The key animation credits are similarly dominated by young talent. Save for a couple of exceptions, who are listed under what might be clean-up work, the lineup is bursting with young talent; ranging from people who started in 2011 as the most veteran 1st key animators, to someone like Aoi Matsumoto whose debut as key animator was that exact episode. I honestly have no comment about this. The result was obviously enabled by someone like Kigami leading the episode, but it says a lot that the studio’s traditional animation aces didn’t need to even touch this episode. Make way for the newer generations bred in this environment. I’m struggling to imagine what the final performance will be like at this rate, but having to jump bars you set yourself is a good issue to have. Anime News Network credits Yuko Myouken as Yuko Akami, Yuuki Tsunoda as Yuki Kakuda, and Tatsunari Maruko as Tatsutaka Maruko. That’s Japanese names for you! We have correct transcriptions thanks to magazine illustrations and the likes, otherwise it can be hard to tell how to actually read them. I called her Akami for the longest time, her surname is hardly common. Both confirmed with the spellings I used too, on mags/staff books. Either way, both of them did great work this episode. Especially since they’re two of the newest animation directors at KyoAni. Also, is Tsunoda really a male? I always thought Tsunoda was female from everything I’ve read. Imgur has https. So use this when you use imgur to post next time. Edited them all! The only reason there are imgur links here and there is that the wordpress uploader is very clunky, so I only tend to use it for files I’ve edited and leave all the straight screenshots on imgur. Thanks a lot for the continued coverage of Hibike! and Flip Flappers. I always read the posts but never comment. Only posting this because the comment section is so empty and it feels like your work isn’t appreciated. It actually is! Thanks for the comment. We have a small readership since it’s a pretty niche approach to anime, but people seem happy at least. I read it as well. Your work is necessary and appreciated. Episode 6’s staff is interesting. Eisaku Kawanami is storyboarding and directing the episode, and Miku Kadowaki is the episode’s animation director. Kadowaki’s presence despite having an upcoming show confirms that Hikiyama is taking a break from animation direction for sure. Looks that way. What about Kawanami himself? What do you think of him handling the episode? From the preview alone it feels heavier on lighthearted comedy than usual, so I’m alright with him directing it.